The Ring of Steall offers everything you might order for a big day out in the Scottish Highlands – with that little extra thrown in. 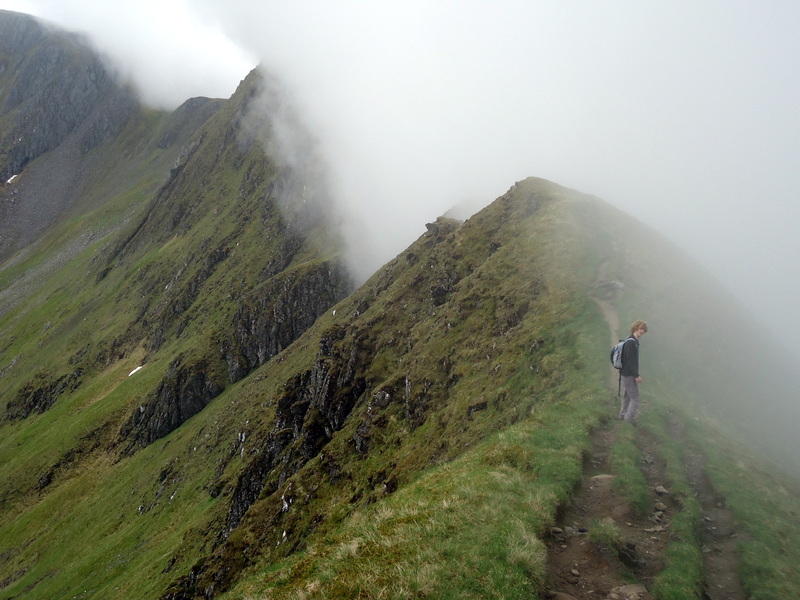 So you get 4 Munros and enough 3,000′ peaks to lose count, easy but airy scrambling, narrow snow-lined ridges even in July, a heart stopping clamber over a rope bridge – and a full day of fantastic views. The little extra ? That would be the ever present vista of Ben Nevis just across the glen, teasing you with a clear view of the whole CMD Arete ridgeline. Start point for our anti-clockwise route was the car park at Achriabhach (NN 145683). Head East along the road for a 100m to pick up a good footpath, slowly climbing the glen beside the Allt Coire a Mhusgain. Leave this track at NN148676 and head up the shoulder towards the day’s first peak, Sgurr a’Mhaim at 3,400′. From here the views really open up, with sentinal of Stobb Ban to the West and the whole Ring curving round to the East. The Ring of Steall : just count those peaks! The next section provides much of the day’s scrambling excitement, earning it’s title of ‘The Devil’s Ridge’. Although you can avoid most of the more exciting sections, the real fun is sticking to the exact crest, along the ridge line towards Stob Coire a’Mhail. 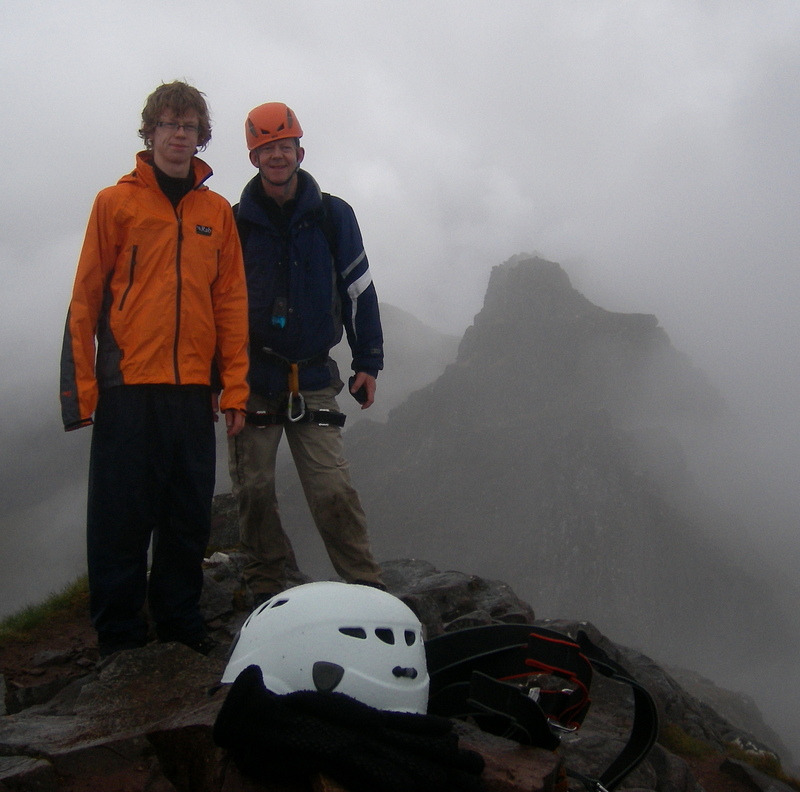 The day we did this there was warm damp air on one side of the ridge, colder drier air on the other. This created constantly swirling clouds, rolling up and back over the crest as we climbed. After reaching the next peak of Sgor an Iubhair, turn to the East and follow the ridge as it broadens for a while, up over the next few Munros, enjoying the fine views all around. The next really exciting section is the crest from the top of Stob Coire a’Chairn along the narrow arete of An Garbhanach. Nothing too scary, just good hands-on fun. 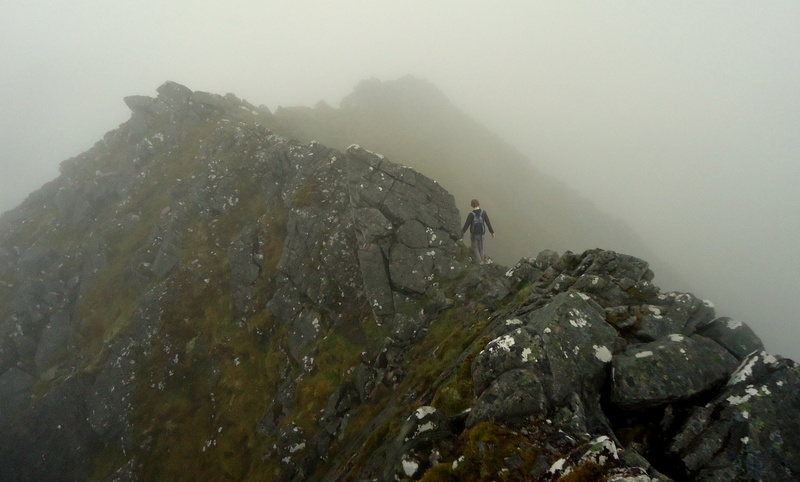 Continue up and over the last Munro of the day (and you will be glad by this time), avoiding the slightly dodgy descent to the Steall by turning down a buttress to the right at NN 184677. 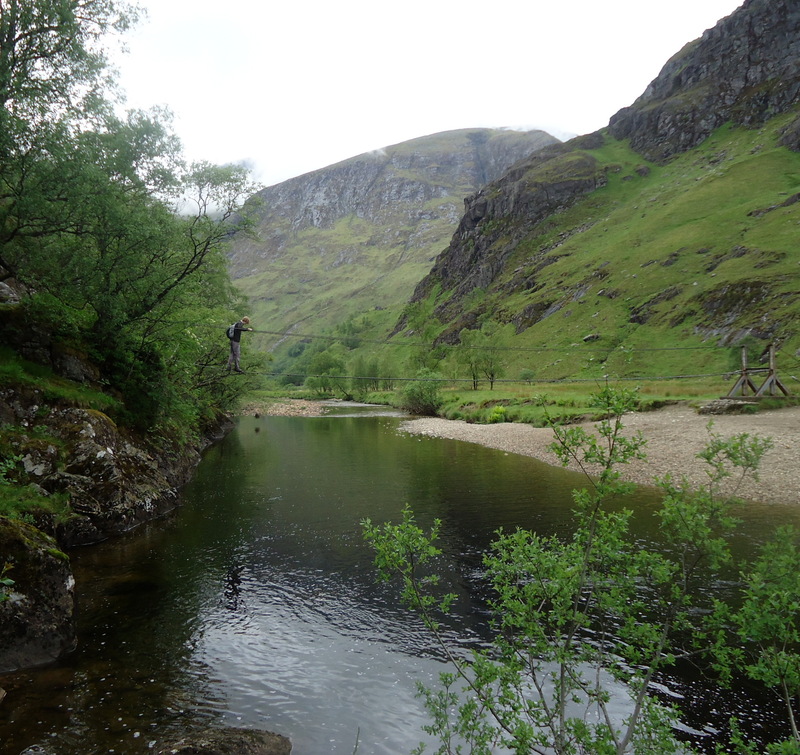 Turn left along the river at the bottom, and take a good look at the famous Steall falls. Continue a while and you’ll come to the day’s last (and probably most scary) obstacle : The 3-rope bridge ! There are only three problems with this bridge : getting onto it, getting across it, and getting down the other side. Apart from that it’s easy. Enjoy! The rest of the walk is pleasant – and slightly unexpected. The broad river basin suddenly steepens, and you end up quite high above what can only be described as an Alpine river gorge, complete with twisted tree trunks and scoured rock faces. Once you reach the tarmac road, it a short mile or so back to the car. Don’t underestimate the full Ring : it is a long and pretty tough day out in the high mountains. Which is just the point – because it also comes chock full of everything we want and love about the Scottish Highlands. 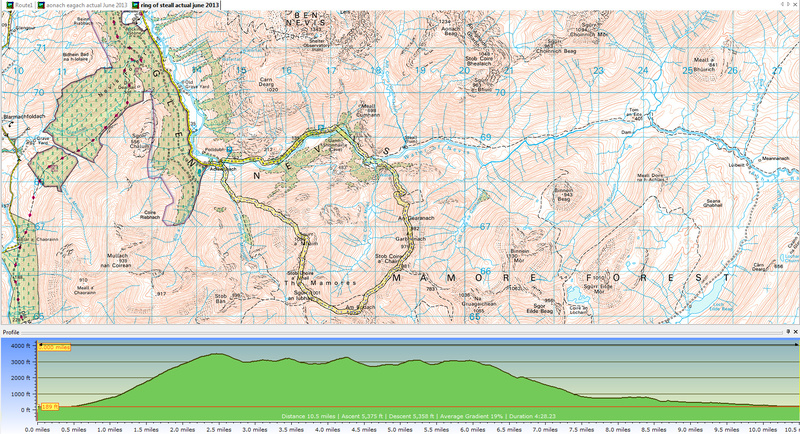 This entry was posted in Fort William / Ben Nevis range and tagged Devils Ridge, Fall of Steall, Munro, Ring of Steall, Scrambling. Bookmark the permalink. ← Llyn Idwal and up the Devil’s Kitchen to Y Garn : the place to go when storm winds howl! Hmmm. Thanks Jake, but it was a lame pun : steall – metal. May I ask what kind of timeframe this hike can be accomplished in? Planning on doing in August. Depends on your fitness level – but we did it in about 8 hours I think. The days are so long from now on that as long as you start in the morning you should be ok.
As always in the Highlands – best to take head torch etc, just in case!